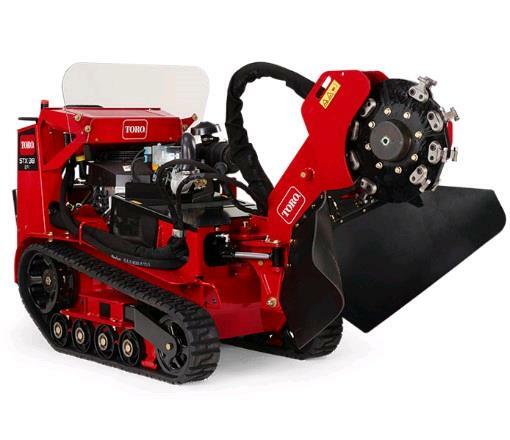 Toro STX-38 Stump Grinder is built for outstanding durability in the toughest conditions. Fully hydraulic operation means no chance of expensive belts breaking or slipping and no tension adjustments. The Intelli-Sweep feature automatically slows the sweep speed of the cutting head based on the load of the wheel, so heavy cutting loads won't bog down the engine. And with easy-to-use TX-style controls and tracks for maneuverability and stability, the STX-38 is extremely operator-friendly. The STX-38's electronic fuel injection engine provides less maintenance, easier starting, and improved performance. Best of all, ground speeds of 4.5 mph allow you to spend more time grinding and less time transporting the machine for greater productivity. **to avoid fuel charge, please return fully fueled. * Please call us with any questions about our stump grinder toro 38hp rentals in Burnsville MN, Rosemount MN, Apple Valley, Minneapolis, St Paul, Twin Cities, South Metro,and Dakota County.